In May, Bond no. 9 will launch I Love New York for Mothers, the fifth fragrance in the I Love New York series (see prior launches I Love New York for Her, I Love New York for Him, I Love New York for All and I Love New York for Earth Day). I LOVE NEW YORK for Mothers is a soft yet focused freesia-laden floral. Gentle freesia, in fact, is one of its introductory top notes, partnered with tangy, wakeup tangerine. Then comes the simultaneously enticing and soothing heart of the scent: heady, tropical jasmine sambac, blended with enchanting lily. The deeper, darker base notes, which sustain the allover fragrance, are those classics—amber, musk, and sandalwood. Bond no. 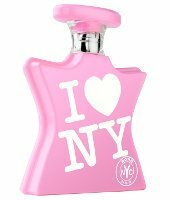 9 I Love New York for Mothers will be available in 50 ($105) or 100 ($175) ml Eau de Parfum. How is this supposed to relate to Mothers? sigh. They’re starting to become the Hallmark of perfume companies. I expect I Love New York for Taxi Drivers and I Love New York for Secretaries next. This one & the Earth Day, admittedly, seem a bit random and not all that related to New York state. Then again, not sure there are enough famous locales in NY state, outside of the city, that would sell perfume. The Hallmark of perfume companies. Yup. Their line is confusing enough as it is, without more theme flankers of murky origin. The only one of their vast line that I like is Chinatown. Fire Island has serious competition from other suntan perfumes. I agree with you and I am looking forward to I Love New York for All Others. I wonder if they will attempt to keep Hallmark and American Greetings from using the word “Mothers”. Are they seriously going to put out a fragrance every month from now on? Central Park West in March, then the Earth Day one in April, then this one in May and I assume an I Love NY for Fathers in June ….. They said this particular series would get 15 perfumes. Gotta agree it does not seem like a good idea, from my standpoint anyway — seems like it dilutes their original concept, esp. given that they’re already doing the Andy Warhol & the store-related (Saks & Harrods) scents. I just went to the the Bond No. 9 website and counted 56 fragrances since the company was formed in 2003. Say it with me now: “Really?” Someone please make it stop! While I know there are some real stunners in there (Chinatown, Fire Island), the law of averages tells me there’s also a whole lot of chav spit being sold to the masses too. Do they just [prettily] package discarded formulas that they have stored in vats in a New Jersey warehouse? How else would the scents multiply so quickly??? Ridiculous. I am officially turned off by Bond No. 9. 56 frangrances since 2003?? Quantity over quality? They lost me at “freesia-laden” (ok, and that hiiiiideous bottle). Hmmm….I have a couple of their scents (New Haarlem and High Line.) I like them both. This new series leaves me feeling like it cheapens the brand a little bit. I don’t know why – the easter egg colored bottles? Mere oversaturation? The interesting designs they do from time to time get lost in the flood. I mean, for me it’s hard to keep track just of the names of the ones I like. This has been a widely unsuccessful range for me, except for about 2 or 3 which I really love. However, freesia is one of my favorite flowers, and aside from Chanel Beige, I haven’t found another I love. Will definitely test this if I can.